Features that prompt a response every time! Collect feedback using Surveyapp on your tablet or iPhone, even offline. Surveyapp makes it a pleasure to build surveys that are enjoyable for respondents, and rich in insights for you. 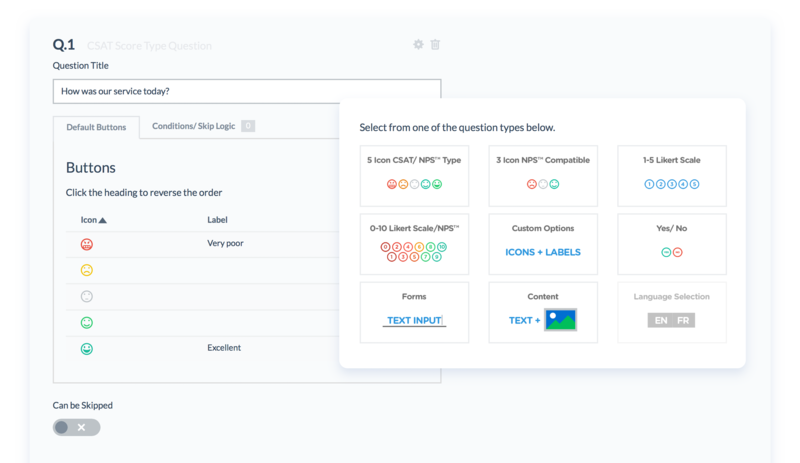 Create your own survey questions via the easy-to-use interface, and deploy them in seconds to immediately start gathering the customer intelligence you require. Fast and simple to set up, just install Surveyapp on your device, design your first survey online, and start collecting responses straight away. 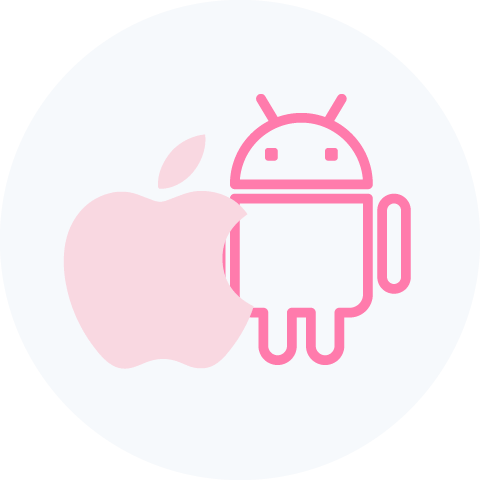 Surveyapp surveys work on both the Android and iOS operating systems. Run your survey on an Android tablet or iPad, or even on an iPhone. No signal? No problem. Capture responses even without an Internet connection, using Surveyapp’s handy offline surveys functionality. Created by designers who understand software usability and attention to detail, Surveyapp’s attractive, conversational interface ensures a seamless user experience. There’s no need for physical access to the device your survey will appear on – design your survey wherever it’s convenient, and deploy it online from anywhere. From single-tablet surveys to premium options for footfall hotspots, Surveyapp is easily scalable with your organisation’s changing needs. Gather responses quickly and easily, dig deeper with follow-up questions, and use question branching to tailor your surveys to your respondents. Whether your preference is smileys, scales or a mix of everything, Surveyapp lets you build surveys your way to gain the precise insights you need. Combine familiar smiley-face options with alternative question types, such as Net Promoter Score (NPS), Likert scales or free text – the choice is yours. Use Surveyapp’s skip logic and conditional branching functionality to maximise engagement, by tailoring questions based on respondents’ previous answers. Customise and personalise surveys to match your brand, by adding a logo or background, or choosing an appropriate design and colour scheme. Ask questions in your respondents’ own languages. Surveyapp supports the design and analysis of questions in any language, including Japanese and Arabic. 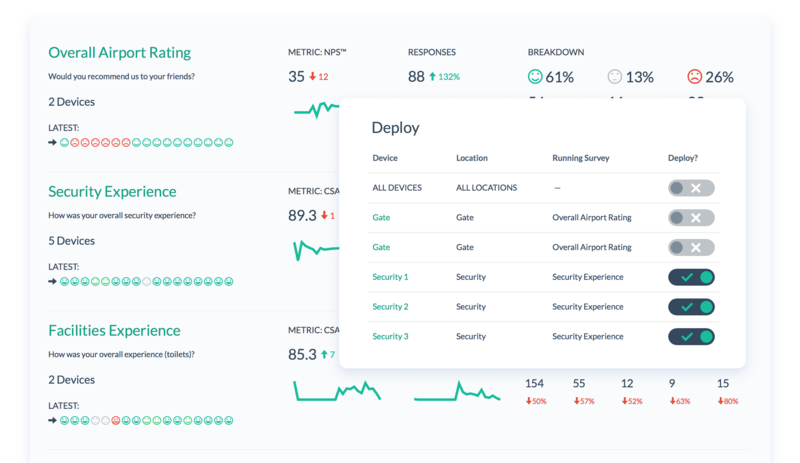 Gather instant, actionable feedback from your customers or staff with Surveyapp’s user-friendly surveys, delivered via a hand-held device or a dedicated terminal. Surveyapp uses familiar smiley emoticons to let you create surveys that are visual, recognisable and encouraging for your customers or employees. 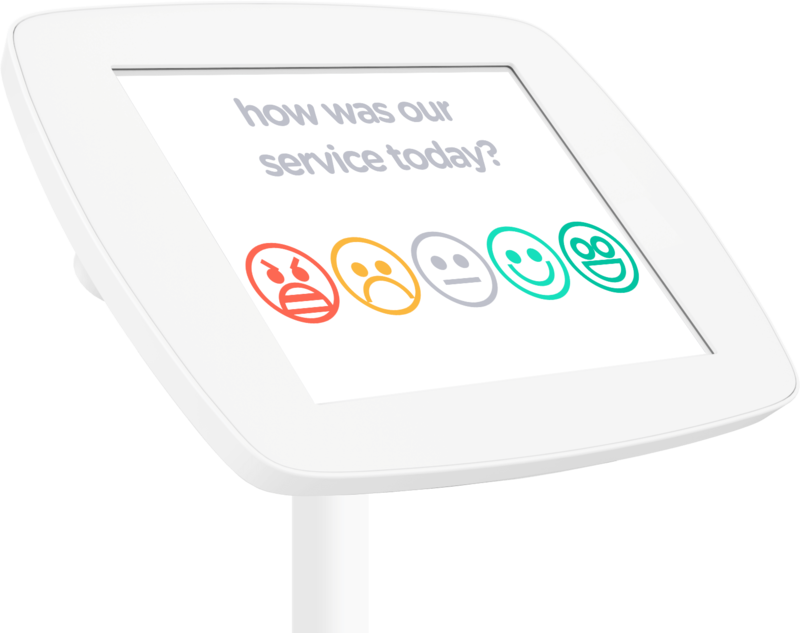 The smiley survey format makes it easy for respondents to answer quick and targeted questions via a hand-held tablet or terminal. Ask follow-up questions to understand the reasons behind your customers’ responses – and what they want you to do to improve the experience next time. From the clear, intuitive survey design to the attractive survey terminals, engaging experiences underpin the Surveyapp respondent’s journey. Respondents can go back and update their previous responses any time up to clicking the final submit button. Including a stand, tablet and dedicated software, Surveyapp’s survey terminals feature a full kiosk mode, with pin-protected access for security. Choose to collect customer contact information, and send a pre-configured, auto-reply thank-you email immediately upon completion of the survey. The kid-proof survey interface ensures the integrity of your feedback by preventing repeated presses, or responses that come too close together. 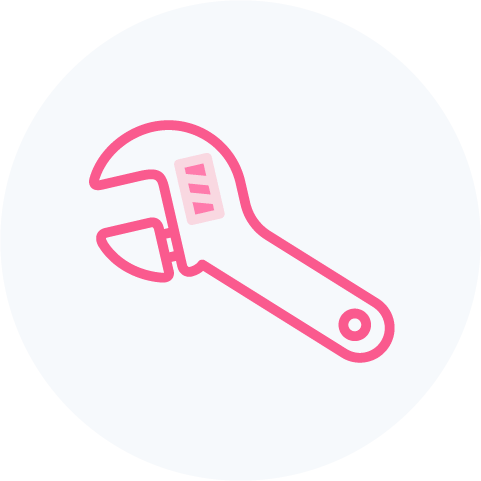 No dodgy error screens – the Surveyapp software automatically times out and resets if a survey is left unanswered or is abandoned partway through. Are customers only passing by at certain times of day? Conserve energy by scheduling your tablets to go to sleep during pre-determined periods. Surveyapp’s powerful reporting suite delivers continuous, real-time feedback and advanced analytics. Empower your frontline managers to identify issues, spot trends, and implement the actions that will create better experiences for your customers or staff. Get live survey results delivered to your mobile or desktop device, to help you monitor and react to changing service levels in real time. Use survey data your way – view it on your device as it comes in, or download it to Excel to carry out your own offline number-crunching and analysis. 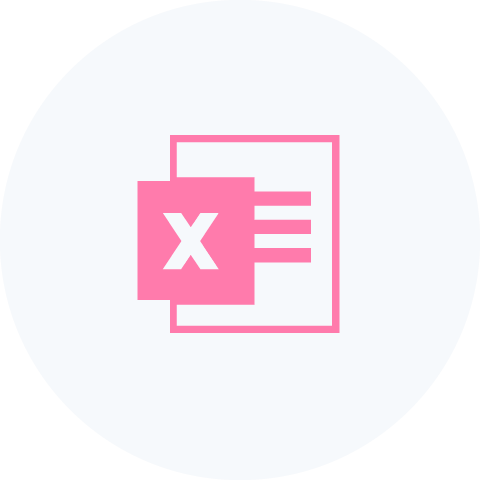 Enjoy viewing insightful and user-friendly reports on Surveyapp’s dynamic online dashboard, or download and share them as PDF or Excel files. A choice of question formats lets you gather the insights that matter to your business – track your Net Promoter Score (NPS), or monitor your CSAT ratings. 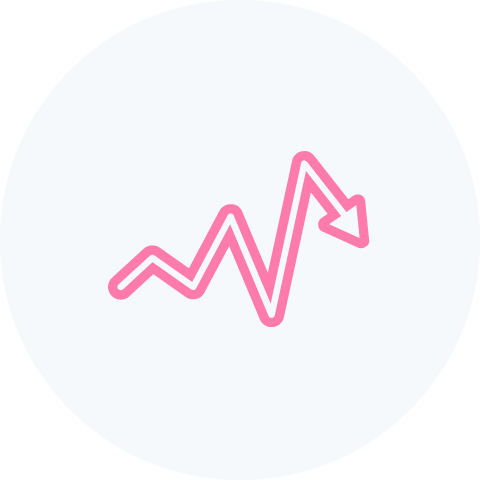 Use trend reports to track the impact of your changes – gain valuable evidence of when customer experience is improving, or when new issues need fixing. 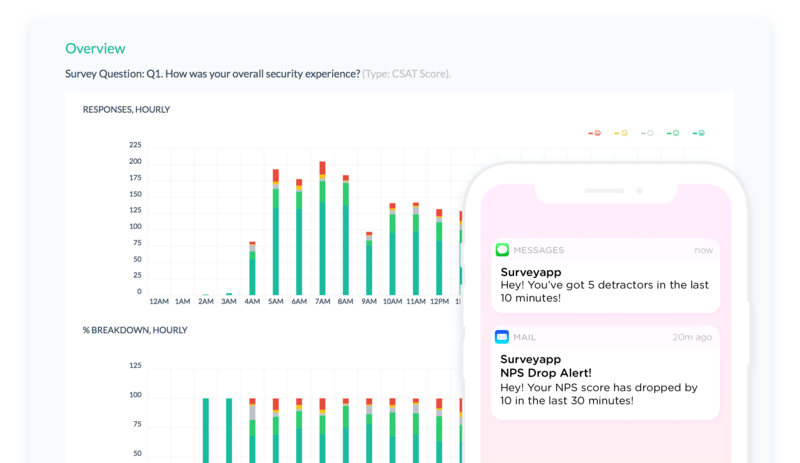 Surveyapp’s built-in text analytics mean it’s easy to make sense of responses to open questions, and to understand why customers feel the way they do. Mobile wallboards transform live Surveyapp data into clear and relevant graphic information, to motivate your team and aid service recovery. Set up real-time email notifications, and focus on the most time-critical data by customising your alerts based on questions or responses. Receive live alerts by SMS, and customise your notifications to trigger an alarm when responses to certain questions highlight urgent service issues. Integrate Surveyapp with your case management procedures by assigning different alerts to different staff based on their areas of responsibility. Set up scheduled reports to deliver regular insights to your and your managers’ inboxes, to help track trends and support decision-making. Assign staff to view or edit only certain surveys for certain devices, using Surveyapp’s comprehensive user management tools. Set up scheduled reports to deliver regular insights to your and your managers’ inboxes. Add your own tags to categorise responses once they’ve arrived, helping you track trends and prioritise actions. From preventing abuse by users to ensuring that only the relevant managers can access your data, Surveyapp is built on delivering a robust, hassle-free experience at every stage of the process. Countless teams rely on Surveyapp for their real-time feedback. That’s why Surveyapp strives for maximum availability for both businesses and customers. Every Surveyapp connection is secured with HTTPS. This SSL encryption ensures that all communications are protected from eavesdropping and tampering. Define multiple user roles, so that your team members only have access to the data and reports that they really need. 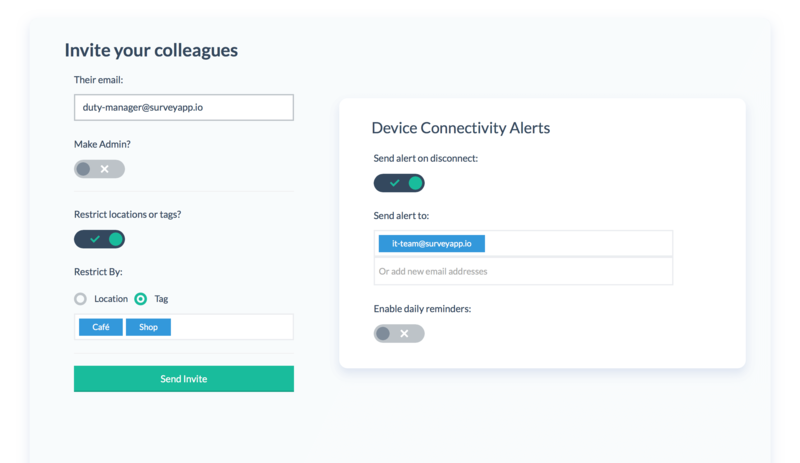 In the unlikely event that something goes wrong, device connectivity alerts and reports make it easy to get Surveyapp up and running again. Interested in the complete Surveyapp solution? Ask about our popular Enterprise Plans, which include stands, tablets, unlimited survey responses, and access to a dedicated account manager.